Research author Professor Alexander Nemchin, from Curtin's School of Earth and Planetary Sciences, said the 1.8 gram sample showed mineralogy similar to that of a granite, which is extremely rare on the moon but common on Earth. "The sample also contains quartz, which is an even more unusual find on the moon," Professor Nemchin said. "By determining the age of zircon found in the sample, we were able to pinpoint the age of the host rock at about four billion years old, making it similar to the oldest rocks on Earth. "It is possible that some of these unusual conditions could have occurred very locally and very briefly on the moon and the sample is a result of this brief deviation from normality," Professor Nemchin said. "However, a simpler explanation is that this piece was formed on the Earth and brought to the surface of the moon as a meteorite generated by an asteroid hitting Earth about four billion years ago, and throwing material into space and to the moon. "Further impacts on the moon at later times would have mixed the Earth rocks with lunar rocks, including at the future Apollo 14 landing site, where it was collected by astronauts and brought back home to the Earth." Did Nixon fake the Moon landing? Oh whoa! Is that where I left it? Man, that was a gnarly LSD trip in '62 aboard that mandala flying saucer. Me & the boobsey twins were just joking around. Don't remember who suggested leaving those Earth rocks behind. Well, it was hilarious at the time! But then again, that was always my reaction dropping acid. Since a number of meteors found on the Earth, are believed to be knock-offs of Mars. Earth splatter onto the Moon is not an unreasonable conjecture. Have any of the Moon rocks collected tested as of Mars origin? So how likely exactly is it for a rock to have been blasted to escape velocity, so that it could get to the moon ? I suppose a big impact would have a small fraction of debris with tremendous energy. 4 billion years ago there were more big impact I guess. Long run for a short slide. Wait... Didn't the entire moon originate from the earth? Why wouldn't they find bits of quartz, granite, and other such rocks? Why presume that such rocks had to have come later? Why would they fake it SIX TIMES? ab3a, depends on which of the hypothesized models of Luna origin, you would prefer to believe. This will support the scientists who look through Moon meteorites of material ejected to Earth for minute grains that can have traveled through impacts from Earth to Moon in the first place. @unrealone1: You propose an unlikely conspiracy. And the discussed find contradicts it! @syncop8: Assuming a hypervelocity (faster than sound in rock; also faster than escape speed) impactor from the asteroid belt, it would itself melt but its shock waves spallate away crust. Of that a few percent are ejected at higher than escape speed at angles coincident with the rarefied air column of the entering impactor. Moon was much closer to Earth at the time, and some of the accumulated ejecta - as you say, it happened ferquently enough - had a fair chance striking it or getting caught in its gravity field. There is a maximum 200 Myrs gap between the rock formation on Earth and its burial in the Imbrium impact, so it did not even need to travel directly but could have been swept up later. @ab3a: Right, but looking for such grains was just the initial filter for a tedious search. It was the isotope chemistry that clinched it, see the paper on how it cannot be Moon material. No but he certainly bollixed the US space program by giving them Shuttle. There are two other plausible explanations outside of faked moon landing. 1. 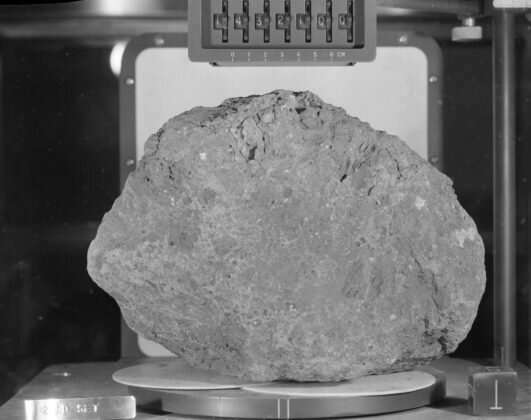 The NASA actual sample was stolen or removed and replaced with a similar looking earth rock. Bearing in mind how valuable the moon rock is, its quite reasonable. 2. I support the theory that the moon was once part of earth that was separated in a massive plant level collision. No, NASA didn't fake the moon landings. But, they wanted the biggest PR bang for their buck because, up until Apollo, the Soviets were kicking their butts in every "first" in space. So, they went to Hollywood and got Kubrick, fresh from making 2001, to "direct" some of the photos, to make them look really spectacular. Problem is technology changes, times change, people become more savvy to the telltales of photoshopping. . . So, then they did what comes naturally--created two narratives, a false mainstream narrative that the photos were all legitimately from real moon landings, and an even falser conspiracy narrative that the whole series of missions was faked. Now, you either go down the rabbit hole of faked moon missions and are lost in the mirrors, or you believe that everything is legitimate and on the up and up . Kubrick put his confession to photoshopping the moon landings in his move "The Shining" if you're interested in connecting the dots. Robert E. Sherwood, Jules Verne & Jack London. Who are the Futurist Arts Directorate for the Uranus Conspiracy. Who have for centuries, been manipulating all telescopic images of the Moon. jax I don't know whether or not, you are am agent-provocateur fpr the theosophists or the illuminati? Or the Mars Supials or the Venerian Dionaea? But we're keeping an eye on you!